Sweet, Salty, and great for Halloween parties! 2. Pour Vanilla CANDIQUIK® into a piping bag (or a plastic Ziploc® bag with a small corner snipped off). 3. 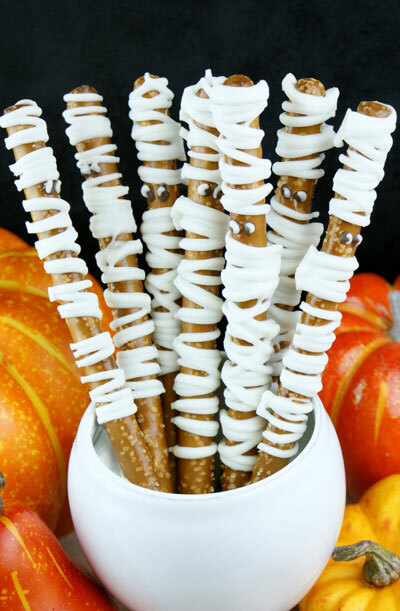 Arrange pretzel rods on a large piece of wax or parchment paper. Drizzle the coating over the top 3/4 of each pretzel rod, leaving a small empty space for the eyes. 4. Using a toothpick, draw on eyes with melted Chocolate CANDIQUIK®.